Folk paintings (Dong Ho folk woodcut paintings, hang trong paintings and religious paintings from the northern provinces) have been an indispensable part of Vietnamese tradition, especially during Tet, where it’s customary for people to hang the paintings in their homes in the hope of receiving good fortune for the year to come. The subjects of these paintings depict everyday life, ranging from pets, social evils and national heroes to religion. 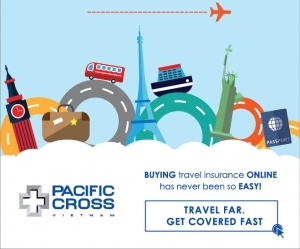 Unfortunately, the tradition has now faded in the face of modernization and globalization. Folk paintings are a part of my childhood. Walking down memory lane, I could see them in my textbooks, my fable books: vivid paintings of pigs or of rats wedding hung at my grandmother’s house. But the idea for the project Folk Paintings – the Remake didn’t cross my mind until I visited the National Museum of Fine Arts to find inspirations for my graduation project. Back then, after getting lost in the museum, I found myself in the area for folk paintings, a deserted corner that I hadn’t seen before, even though I had been in the museum many times. In this very spot, impressed by the diversity of the museum’s collection with so many paintings that I had never seen before, I decided to revamp them using a technique that combines traditional media and modern graphic style. My technique is a variation of pencil drawing (the most basic technique) and graphic elements such as the use of gradient and bright colors. Additionally, I added some personal details and touches to the forms and shapes in each painting, but the overall structure remained unchanged. After the first work in the collection was posted on my social media pages, I received a lot of positive feedback from my friends and teachers. And that’s how the project was initiated. 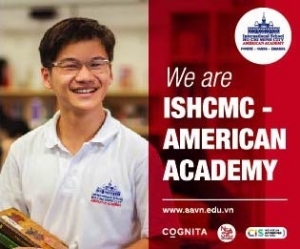 The aim of this project is to uphold the traditional values of the folk paintings and inspire the younger generation to discover and cherish their ancient Vietnamese heritage, and also to recreate nostalgia for those who had the chance to experienced it in the past. 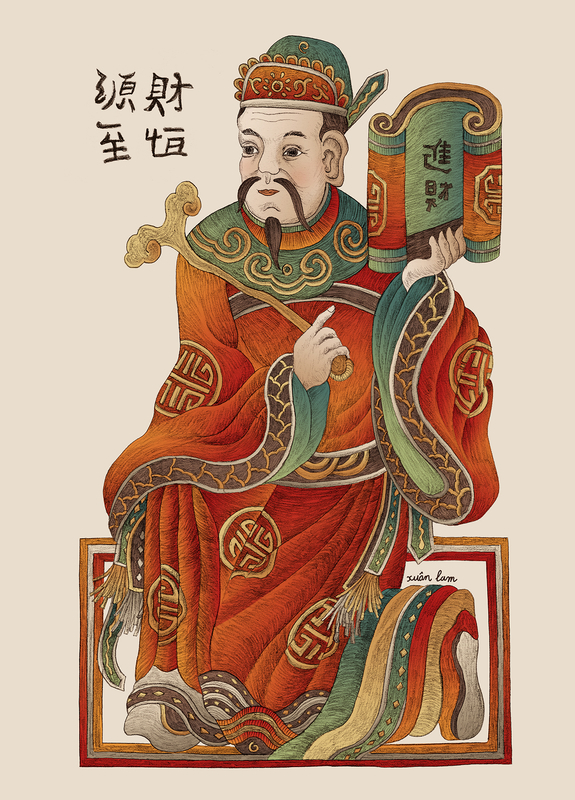 Yue Lao (The Matchmaker Deity) is a god of marriage and love in mythology. She is supposed to unite with a silken cord all predestined couples, after which nothing can prevent their union. 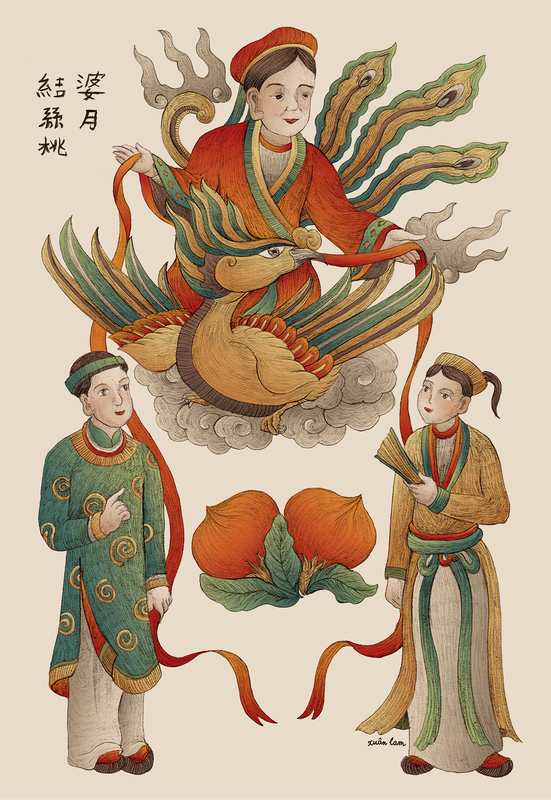 In the painting, Yue Lao, riding a phoenix, is tying the couple with a red cord, which represents the wish that the young boys and girls in the family with soon get married to their suitable partners and live happily ever after. This painting features Ong Hoang Bo, one of the Four Emperors, the third son of Long Vuong Bat Hai Dong Dinh. 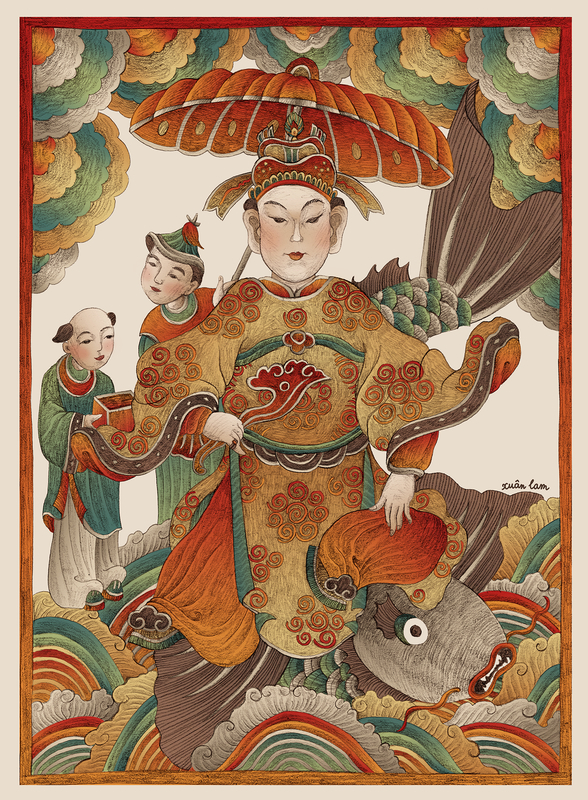 In the painting, the Emperor has a graceful and ravishing appearance, wearing a white large-sleeved ceremonial robe and a wushamao (official headwear of the Ming Dynasty), one hand is holding a scepter, representing royal power. Behind him are servants holding a casket and parasol. 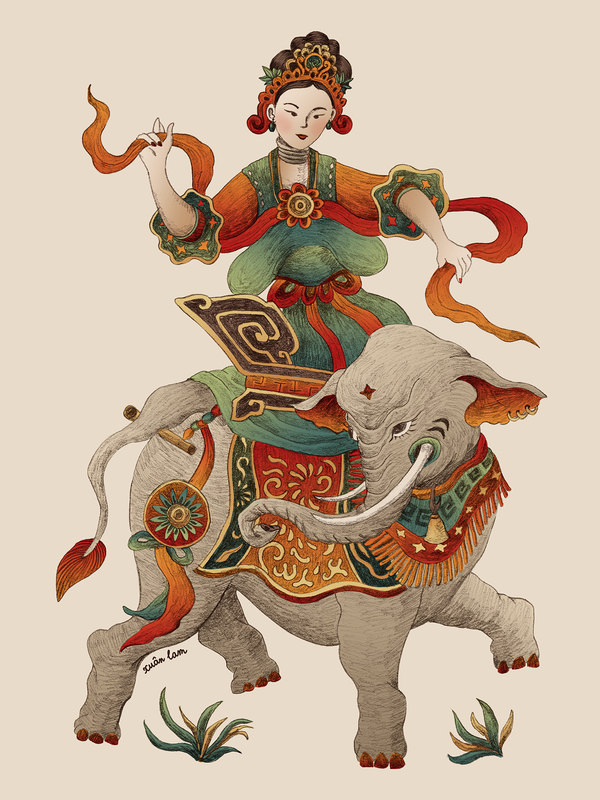 She is the ruler of the Forest Palace among the spirits of the Four Palaces in Vietnamese indigenous religion. Legend has it that the princess was the daughter of prince Son Tinh and My Nuong, King Hung’s daughter. In every dynasty the literature mandarins are those who develop exceptional talent for literature and poetry and strategic planning, military mandarins are those who have mastered martial arts and are great military leaders on the battlefields. 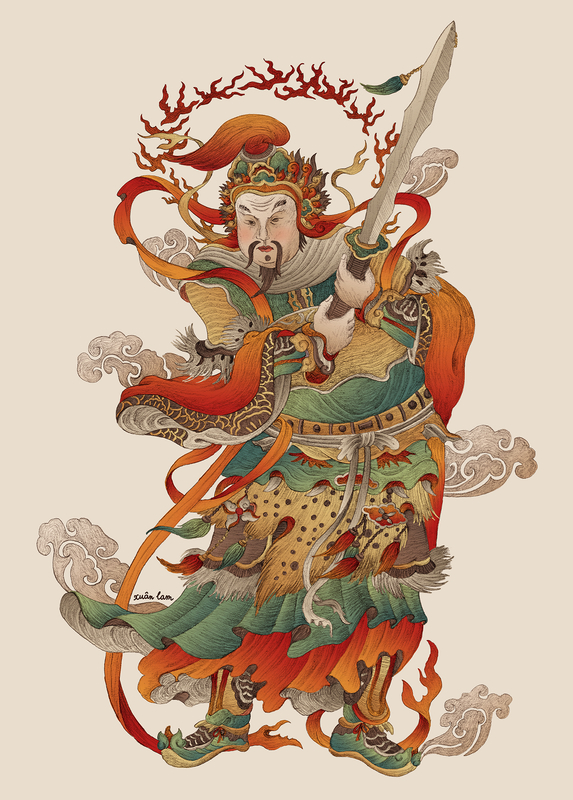 The painting features the military mandarin with an imposing and august posture, reminding us of a Dharmapala (Defender of the Law) in Buddhism. 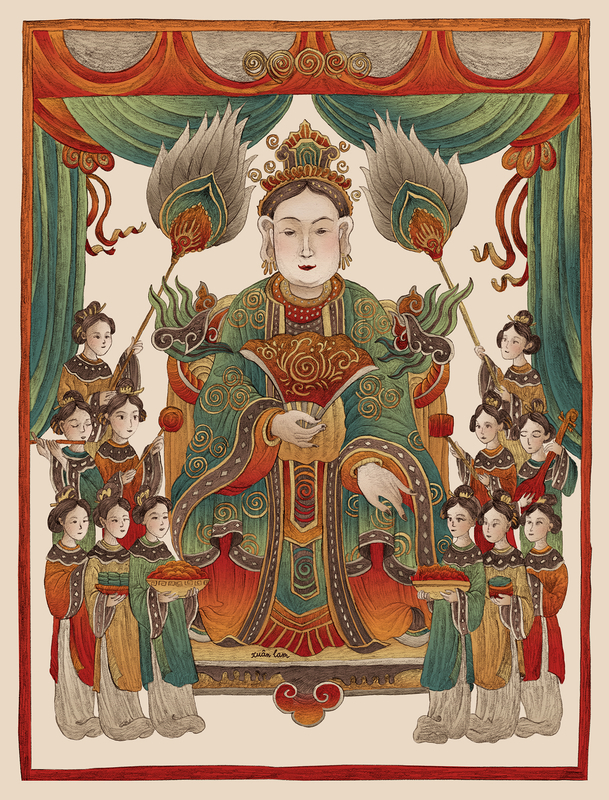 This painting is often hung in front of the house during Tet with the hope of welcoming wealth and prosperity into the home. 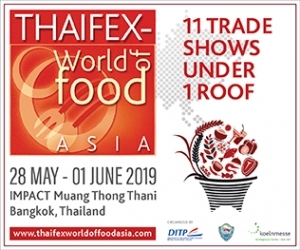 In the painting, the God of Wealth is holding a book in one hand, which represents the acquisition of knowledge, while the other hand is holding a scepter with the phrase: “The wealth comes as abundantly as the water.” This is a lifelong dream of all Vietnamese farmers. 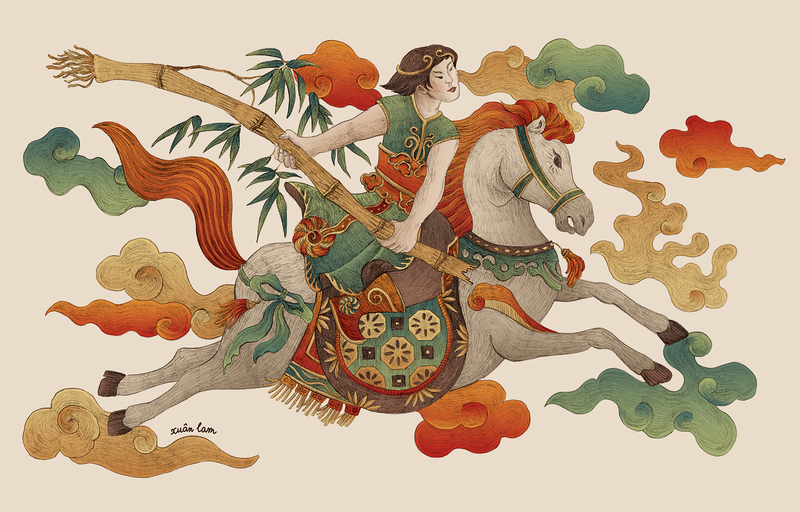 Thanh Giong, (Phu Dong Thien Vuong), is a mythical folk hero and one of the Four Immortals. He is regarded as a symbol of patriotism and youthful vigor.